– ve dvou apartmánech (dva pokoje s jednou koupelnou pod uzavřením) pro 5+2 a 3+2 osoby. 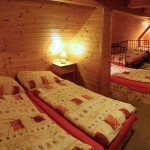 We offer accommodation in 10 rooms with the capacity of 30 beds. 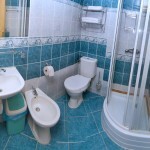 We have double-bed, triple-bed, four-bed rooms and 2 apartments (2 rooms with 1 bathroom) for 5+2 and 3+2 people. Every room has it’s own bathroom. Parking is possible on a near parking place for free of charge.